With so many breweries opening up nowadays (620 did in 2015 according to the Brewers Association), it is sometimes hard to get excited for a specific one to debut. 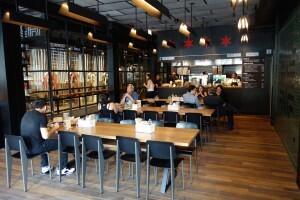 But there was much excitement this summer when Cruz Blanca, the new brewery from Rick Bayless, the restaurateur behind Chicago’s Frontera Grill, Topolobampo and Xoco, opened its doors. Mr. Bayless is a legend in the Mexican cuisine world, a Michelin-starred chef known for creativity, accessibility, authenticity and passion. And when we learned that he and his team were going to get into the brewing world, we began tracking the progress of his new venture with great anticipation. Cruz Blanca is located in the West Loop neighbourhood of Chicago, an incredibly lively food and drink haven already home to The Publican, brewpub Haymarket, famed restaurant Girl and the Goat and its sister Little Goat Diner, the Three Floyds-focused pub Lone Wolf and the delicious Green Street Smoked Meats. The area has transformed from a meatpacking district to a day and night playground for the senses with no indication of slowing down. And with the simultaneous openings of Cruz Blanca and its adjoining neighbour Leña Brava (also by Rick Bayless), the area became even more of a magnet for food and drink lovers. Upon entering the attractively designed space one is immediately greeted with two options: the Cruz Blanca “Cervecería” or “Taquería”. 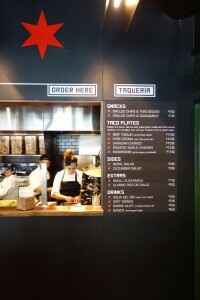 Beers are available directly from the 10-seat-long bar located on the left hand side of the room, and tacos are available from the counter located to the right. Numerous communal tables (no reservations here) fill the space along with a front patio on Randolph Street. 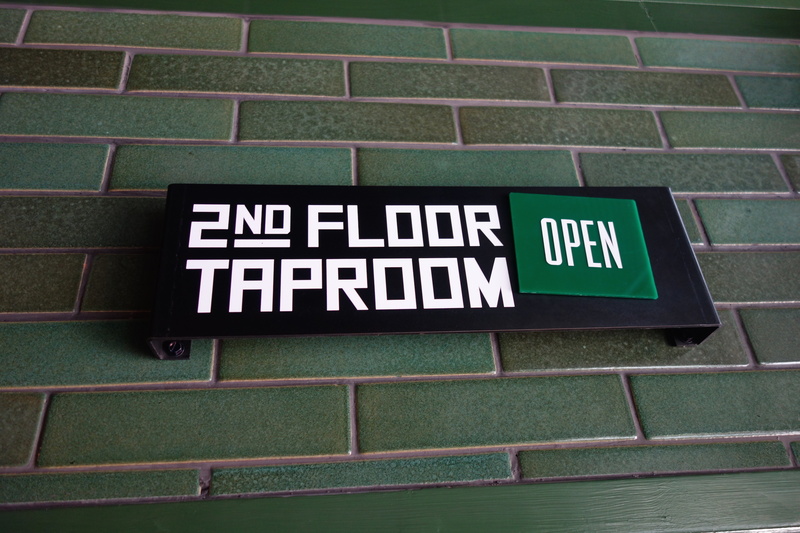 A second taproom sits above the main room, featuring another long bar adorned with TV screens, although the large windows overlooking Randolph are equally if not more interesting. Bar or counter service is the rule of the house, which means less waiting for a delicious beer which is very much appreciated. There’s a story to this new brewery, one rooted in Mexican brewing history. Emil Dercher was a European who left France to Mexico City in the 1860s and opened one of the first breweries there, naming it Cruz Blanca. With this inspiration, the new Cruz Blanca brews interpretations of German, French and Austrian styles as would have been present in Mexico City during the original incarnation, but with a modern twist and featuring unique ingredients from the present day. 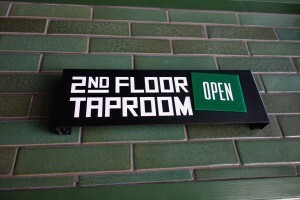 The three-level establishment integrates the brewery throughout the space. On the upper floor lies the grain mill, feeding the 10 barrel Newlands brewhouse located behind the bar on the ground level. From there bright tanks live in the basement directly feeding the main bar, as do a few more behind the bar on the top floor. 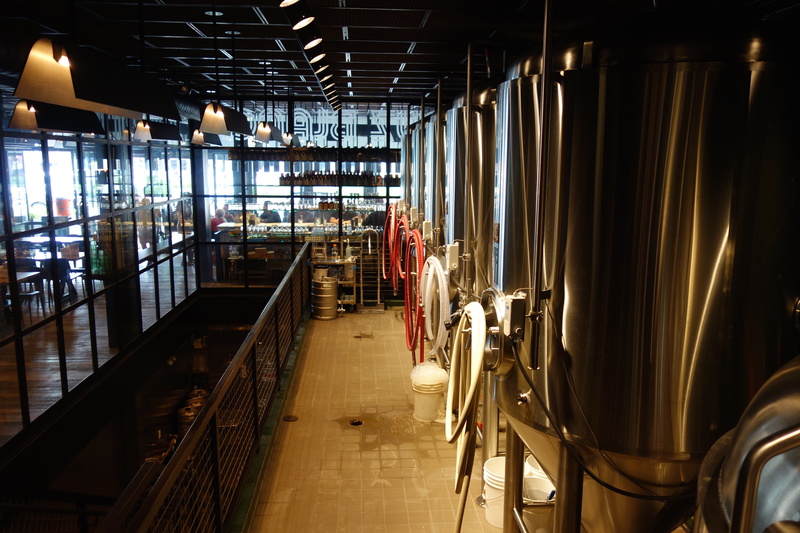 A immaculate cold room is also present on the lower level for kegs and guest brews. Coming soon to the brewery is a bottle filler and a barrel program to even further the capability of this impressive new operation. 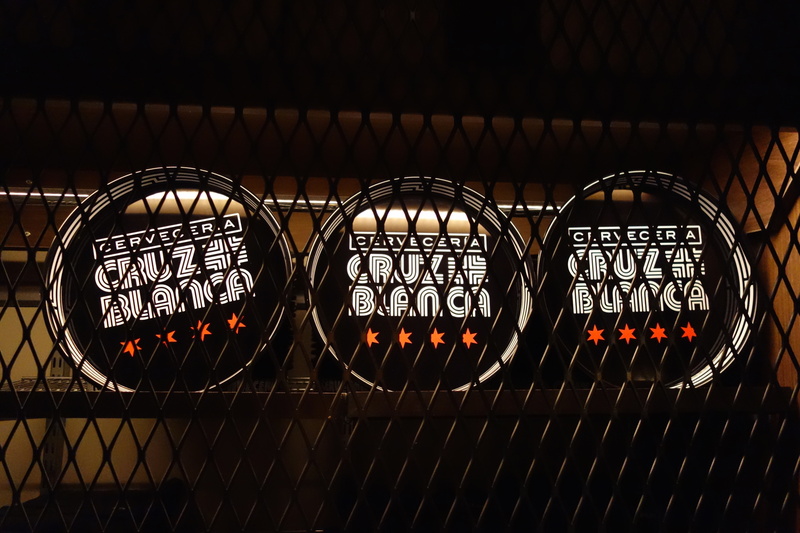 Cruz Blanca’s house brews are anchored by a trio of bière de garde styles under the La Guardia banner: Rubia, Ambar and Morena. With consistent yeast and hops across all three brews, each beer has a unique malt bill and featured ingredient. The Rubia, the lightest of the three clocking in at 6.8% is a sweet, orange coloured brew with local Illinois honey; Ambar features Mexican hominy at 7.5%; and the boozy Morena packs a punch at 9% with Mexican Piloncillo sugar resulting in a lingering sweetness. A common theme amongst Rick Bayless’ restaurants is their commitment to local farms, and their beers follow this philosophy, as malts in their beers are from the Sugar Creek Malt Co. in northern Indiana. Other beers in the house lineup include Smoke Alley, a 4% delicately smoked wheat ale inspired by Oaxaca’s taco corridor of the same name, Winnow, a rich and delicious 6.9% American porter made with cocoa bean husks from sister restaurant Xoco, and Básica, the hoppiest beer of the bunch, a crisp 6% wheat lager made with Chinook and Cascade hops. The beers of Cruz Blanca are unique and interesting, accessible but flavourful. It is clear that they do not follow the traditional pattern of new brewpubs today, but have carved their own path of originality with stories behind each recipe and the quality to match. The remaining taps featured guest brews from local breweries that helped with the pilot batches as Cruz Blanca was getting up and running, including Perennial, Penrose, Revolution, Half Acre and Metropolitan, but in recent days more house brews have been coming on the line (a Vienna Lager and Hoppy Kolsch were in the works during our visit). After only a few short weeks from visiting there is already more new to try. Cruz Blanca also features a daily radler, with a rotating agua fresca flavour mixed with Smoke Alley (and a mezcal option to turbocharge that), along with beer-to-go in freshly-poured growler (64 oz.) or howler (32 oz.) form. And what would a Rick Bayless restaurant be without Mexican cuisine, and Cruz Blanca delivers with an all-fire kitchen (no gas lines in the building) featuring steak, pork, chicken, chorizo and mushroom tacos, alongside other snacks and sides. As Todd White, Lead Bartender and Assistant Manager put it, “Come in, find a spot and make it your own”. This encouraging rule is evident at Cruz Blanca: it is a welcoming spot to try many delicious varieties of beer and food where one could easily settle in for an entire day exploring the many tastes of this dynamic new brewery and taqueria. 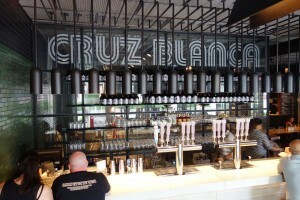 Cruz Blanca is an excellent addition to the already dynamic beer scene of Chicago. Its beer list breaks the mold for most new breweries with a lineup full of unique beers made with interesting stories and ingredients. 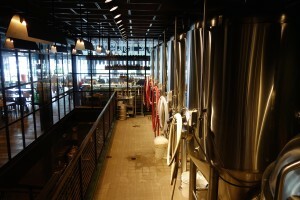 The design is top notch, the beers are delicious and the experience is friendly and memorable. As complex of an operation as Cruz Blanca is, their mantra was described to us as “warm smiles, cold beer.” And here, there’s nothing else we’d rather have. Cruz Blanca is located at 904 W. Randolph Street in Chicago, Illinois. The brewery and taqueria is open from 11am until 11pm from Tuesday-Thursday, until midnight on Friday and Saturday, until 9pm on Sunday, and closed Monday. Special thanks to Head Brewer Jacob Sembrano and Lead Bartender and Assistant Manager Todd White for their generous participation in this feature.